My daughter is a geek. Well, everyone in my family is to one extent or another. I consider myself a craft geek, full of trivia about glues, drills, techniques and history. My husband loves physics, my son loves games. The Turnip loves science fiction. She's 14 and her big bag of holding that she carries with her everywhere has in it usually a light saber, a communicator, a phaser and 2 sonic screwdrivers. She can tell you how different effects in movies were made because she's the one they did the director and actor commentaries for. She watches all those extras. 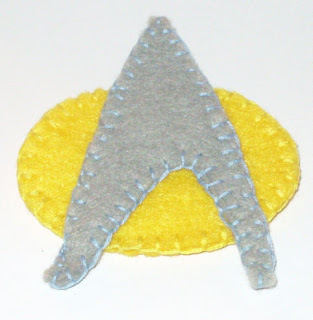 I made her a Star Trek:TNG communicator badge out of craft felt. 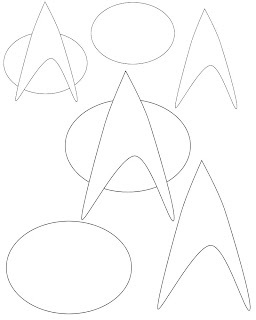 I cut out 2 each of the shapes, the smaller ones in my diagram, then stitched them together using a blanket stitch and 3 strands of embroidery floss. Stitch a pin on the back and it was good to go. Then I put it on and wore it until she noticed. She told me I looked like Troi (I'm wearing a square necked sort of low cut teeshirt today). She likes it a lot. Here's the pattern I used for it, plus I did a slightly larger one that would work for appliques on fleece scarfs and such. Or you can use it as an embroidery pattern. Click on the image to download the full sized version. ETA: Check out Abigail's great How to Sew Felt Microbe Stuffies project for more felty fun! You are so fun! I love this! I'll have to make one for myself and my dog. We *love* Star Trek! Ooh and I'll have to link in the next Geek Craft Roundup- I love that roundup!